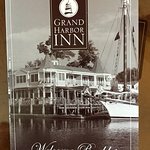 The Grand Harbor Inn is a very special place over looking Camden Harbor. The rooms are spacious and relaxing and has many details that enhanced our visit. The bed was very comfortable, the shower was amazing and the deck was fun to relax and watch the harbor. Breakfast was served in room which was very delicious. The only bad thing about the place is that we had to check out and leave. Camden is a lovely town. We enjoyed running down Chestnut tree through the quiet neighborhood a couple miles ending up by a farm with Galloway cows. We hiked around Camden State Park for gorgeous views and even did some shopping in town. From all of us here at Grand Harbor Inn we thank you so much for your review contribution! We are so excited to learn of your enjoyment during your stay, and that you were able to experience many of Camden's beautiful and scenic delights such as the leisurely drives, hiking, shops and agriculture. Grand Harbor Inn is very near and dear to our hearts, and we love nothing more than welcoming travelers from all over to show off the beauty of Camden, Maine and our harbor. 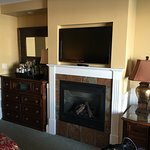 I look forward to welcoming you back during your next stay in Midcoast, Maine and as always with warm smiles and hospitality. My husband and I just spent three nights in this fabulous Inn. The staff was extremely friendly and helpful. The breakfasts delicious. Their recommendations for eating were right on. Room # 5 with a balcony overlooking the harbor perfect. 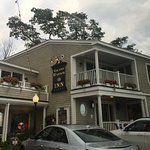 We stayed for three nights during our family trip through New England and we were pleasantly surprised by how charming the inn was. It’s a very small hotel with only ten rooms I believe and all on the second floor. My favourite parts of the room were the insanely comfortable bed, the fire in the bedroom, the powerful shower and the under floor heating. I loved the fact that you get two large luggage racks. There is an espresso machine, microwave and fridge in the room and lots of storage space. The balcony we had overlooked the harbour and was just magical. The staff were great from check-in to check-out and could not do enough for you. The only thing I didn’t like was the breakfast, it was included in the rate so you cannot complain too much, and it is kindly delivered in room at your chosen time because there is no dining room at the inn. However, the juices are from concentrate and the muffins were not great. I really liked the granola it was delicious and the fruit was not to my liking but that is not the hotels fault. This is more of a personal thing with the breakfast, my in-laws has the crustless quiche for breakfast and said it was delicious. If, and when, we come back to Camden we will be coming back here. This hotel is lovely and classy, with an outstanding staff. I believe there are only 7 rooms, so it also has a cozy, private feel.. The gorgeous location made for a very special, romantic vacation. Camden's delicious restaurants and beautiful shops are just a few steps away. Only 1 downside . . . Breakfast could be better in my opinion. For the most part it's nearly the same everyday with average quality for a hotel this nice. Room tip: Enjoy the view from inside Room #1 & it's private corner porch overlooking the bay & harbor. Come on people with the 5 stars!!! 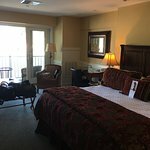 This Inn was not worth $500!! Maybe you are independently wealthy, then it doesn’t matter. But no room is worth $500+ ...even on the harbor, which we weren’t because I just couldn’t see spending the extra money. The room was nice, the bed comfortable, our half a view very nice and the shower was awesome. The staff was very friendly, no problems there. Here’s the one gripe I have.... the breakfast,come on!!! !“fruit”: one TINY triangle of melon,one TINY triangle of pineapple ( the edge near the skin was rotten and should NEVER have been on the plate) one under ripe strawberry and a couple of blueberries. The crust less quiche was more spinach than egg, and the muffin.. not even sure what the flavor was, maybe cranberry? The yogurt parfait was fine, very small. This is an upscale hotel, they could certainly afford a little better breakfast. And hint to the kitchen staff: a little baking soda in the tea pot will remove the stains! And last but not least.... where the heck are the plush robes? We were at the Omni in Boston for less than half the price and they have robes! Thank you for your recent review of Grand Harbor Inn. We strive hard to provide outstanding customer service and create memorable experiences for our guests each and every stay. While we hit most of the marks during your visit, it is obvious that we fell short with breakfast. Breakfast is often one of the highlights of our guest's stay with all of the breakfast items made fresh daily with as many local ingredients as possible. I am so sorry that you felt it was not bountiful nor fresh, especially the fruit. We are reviewing with our staff how this may have happened and ensuring it won't happen again. We are also sorry that we missed the opportunity to make things right during your stay. In reference to the robes, we do provide two plush Cuddledown® robes in each guest room. We certainly could have forgotten to replace them prior to your arrival, but what often is the case is since many of our rooms have more than one closet, they are in the rooms, but just not immediately obvious to guests. Our front desk staff would have been delighted to bring you some had there not been any in the closet. Thank you again for your review, and we certainly hope we have the opportunity to create a much more positive experience for you the next time. Great service from valet to front desk. Nice room with great view. Nice furniture comfortable bed. Serving in room a nice continental breakfast . Room 4 as a greet view of Harbour. Best location in Camden. 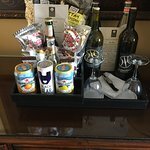 So glad you had the opportunity to stay at both of our 4-Diamond properties here in Camden, 16 Bay View and Grand Harbor Inn. We are very happy you found our service throughout the entire stay to be on point and worth mentioning as well as the wonderful view from your room and the delicious, made fresh daily, in-suite breakfast. As we always strive for perfection and exceeding our guest's expectations, we would love to hear what we could have done differently or better to earn a 5-out-of-5 star rating the next time. We thrive on all forms of feedback and are always looking for ways to improve our service and guest experience. We hope you have the opportunity to stay with us in the future and again want to thank you for taking the time to write us a review.